"Walk Straight My Son ~ As the Old Crab Said to the Young Crab"
For this recipe, it is essential that you use REAL snow crab for the stuffing. 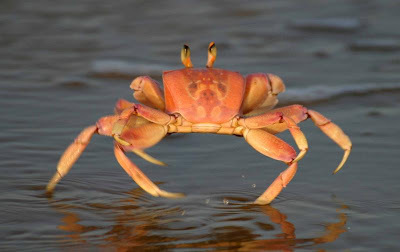 I don't think I'm a snow crab, but I'm pretty! 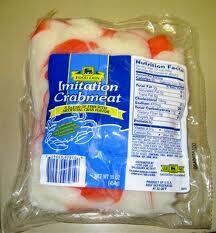 Whatever you do, don't cheap out and buy imitation crabmeat. What is that stuff anyway? Alright, I admit I've bought it and it's not too bad chopped up and turned into seafood salad, but it would most definitely not do for this recipe. Okay, I just threw this one in for fun. You ever have one of those days? 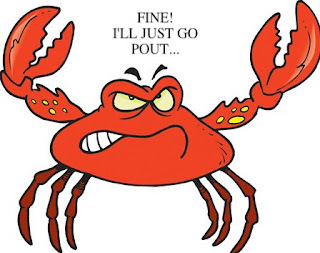 Things started to go wrong around 9 a.m. when I was in the bathroom with my head upside-down, blow drying my hair and Scott (aka The Mister) who was supposed to be at work came in and scared the crab out of me. We don't have a land line and apparently my daughter was frantically calling my cell phone which was by now vibrating itself off my bedside table, where I left it. Geez!!! The Mister was not happy. Apparently the world was going to explode if I did not get down to the high school and sign a permission slip RIGHT THAT SECOND. One, I might add, that I had never been shown, nor knew existed. It was all downhill from there. This was a great dinner. The Mister loved it. Said he liked the chicken better than, say, stuffed sole or flounder. The crab stuffing is really delicious. For the bread crumbs, I had a stale French roll that I chopped up and threw in the blender. You can use any bread you have around, just take it out and let it dry out for a little while before you blend it. Packaged breadcrumbs are fine too, but not the overly-seasoned kind. Crab is delicate and you don't want to overpower it. This recipe was one I copied out of the Marblehead Cooks cookbook I found at the lakehouse in July. I've been working my way through them and so far, they've all been winners. Saute shallots in butter, add sherry and reduce by half. Add crab and cook for 2-3 minutes. Add bread crumbs to bind together and season to taste with salt, pepper and parsley. Cut chicken breasts in half and pound until thin. Place stuffing on one end of chicken breast and roll up, tucking in ends. Dredge in flour. Heat a large nonstick sauté pan on medium high and melt 1 T butter in 2 T oil. Brown chicken rolls. Place the browned chicken in a 13x9 inch dish. In the same sauté pan you used to brown the chicken, add wine and heavy cream, add 1 T. fresh dill; reduce this until it has thickened by half and season to taste with the salt, pepper and herbs. Pour over the chicken and bake at 350 degrees for 25-30 minutes. Serves 8. Oh Dear, I am in luv with this recipe .... anything with crab meat tastes delish. Quite agreed about the crab meat, I love it! You have a nice weekend too. YUM...I never thought of combining crab and chicken...this looks fantastic! Great idea! Yes, they were surprisingly good together!